Located along the winding Shiawassee River, the Tom Graham Memorial Campground located in Showboat Park boasts a lovely wooded setting. It has 70 lots with electricity - as well as a number of primitive campsites situated on the river bank. Showboat Park Campground is part of a 67-acre municipal park within the village of historic Chesaning. The lovely park is on a hillside which rolls down to the river flats. There are softball diamonds, volleyball sand courts, disk golf, basketball courts, a handicapped accessible fishing pier, boat launch, three picnic pavilions, and playground equipment as well as modern restrooms and a bath house with hot showers. 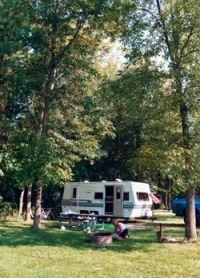 The campground is secluded in a wooded area with a true "up north" feel. And yet, it is only a few minutes walk or a short bike ride away from Chesaning's quaint downtown shopping district. Among the village's year-round attractions are the numerous festivals, a highly-rated golf course, a Riverfront Playscape and many restaurants. The campground is well situated for day trips to premier Michigan vacation attractions including Frankenmuth, Birch Run Outlet Shopping Malls, St. Charles Rails to Trails, the Shiawassee National Game Refuge, the Owosso Steam Railroading Institute home of the steam engine Pere Marquette No. 1225 (famous as the sound effects for the movie Polar Express) and Soaring Eagle Casino at Mt. Pleasant. ​For more information or reservations, call the Village of Chesaning office at 989-845-3800.